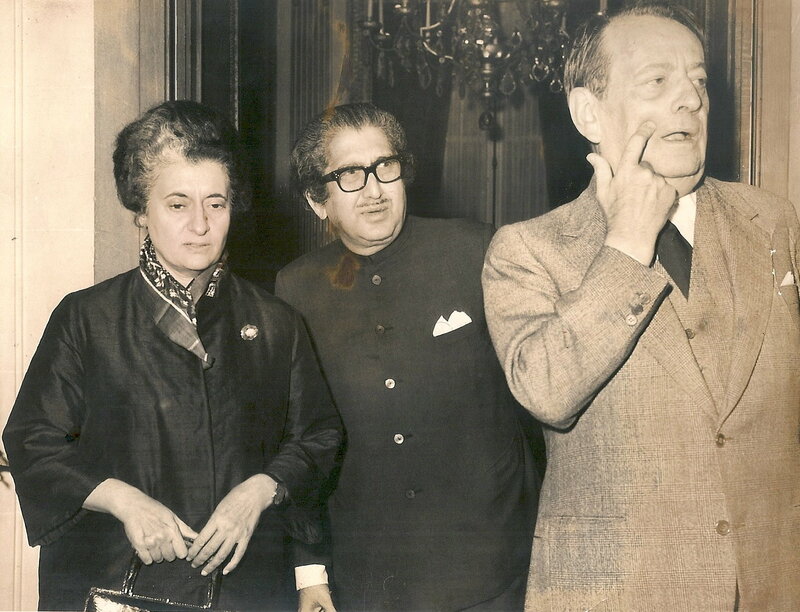 This is a photograph of Indira Gandhi emerging with Andre Malraux for a press-conference at the Embassy of India in Paris in the Autumn of 1971. (My father, pictured in the centre, had been posted to the Embassy just a few weeks earlier in anticipation of the visit. [My father recalls her asking him during or between one of these meetings, “Mr Roy, I am very hungry, can you please get me something to eat?”, and he went and grabbed a small hotel plate full of peanuts which she devoured…]) Indira was making the serious diplomatic effort that she did in world capitals to avert war with West Pakistan over its atrocities in East Pakistan. War could not be averted and within a few weeks, in December 1971, Bangladesh was born. “She had indeed fought that rarest of things in international law: the just war. Supported by the world’s strongest military, an evil enemy had made victims of his own people. Indira tried patiently on the international stage to avert war, but also chose her military generals well and took their professional judgement seriously as to when to fight if it was inevitable and how to win. Finally she was magnanimous (to a fault) towards the enemy ~ who was not some stranger to us but our own estranged brother and cousin. It seemed to be her and independent India’s finest hour. A fevered nation was thus ready to forgive and forget her catastrophic misdeeds until that time….” (From “Unhealthy Delhi” first published in The Statesman June 11 2007, republished elsewhere here). Indians would be naïve to suppose Pervez Musharraf has at any point shown friendliness towards India or willingness to come to a genuine permanent agreement over J&K fully consistent with law and justice. Musharraf tells everyone and himself every day that he is a soldier, and it is well to remember he is from the last generation of Pakistan military men motivated by visceral hatred of the Indian Union and a wish to inflict any kind of defeat upon us. Pakistan’s new Army Chief, General Ashfaq Kayani, being a decade younger than Musharraf, may have a less irrational, less belligerent outlook towards India, and it would be a wise Indian move to invite him officially to visit and receive the normal courtesies and honours due to a foreign military chief. Musharraf, like Ariel Sharon, was visibly uncomfortable with the Hindu rituals we compel foreign leaders to carry out at Mahatma Gandhi’s Memorial; but General Kayani would visit purely as a military chief and not have to make any political gestures. As long as Musharraf remains in power, we may expect him to continue to be motivated by his overtly anti-Indian 12 January 2002 speech. Yes, he said, Pakistan would cooperate against terrorism but it expected the USA to reciprocate by pressuring India on Jammu & Kashmir. “Kashmir runs in our blood. No Pakistani can afford to sever links with Kashmir… We will continue to extend our moral, political and diplomatic support to Kashmiris. We will never budge from our principle (sic) stand on Kashmir. Kashmir has to be resolved through dialogue in accordance with the wishes of the people of Pakistan (sic) and in accordance with the UN resolutions.” (BBC 12 January, 2002, Musharraf speech highlights). Pakistan’s first Prime Minister, Liaquat Ali Khan, during his 1950 visit to the USA had claimed “culturally… Kashmir ~ 80 per cent of whose people like the majority of the people in Pakistan are Muslims ~ is in fact an integral part of Pakistan”. Now, as a matter of fact, Kashmir does not “run in the blood” of Pakistanis nor do the many diverse and ancient cultures of Jammu & Kashmir have much to do with that of a relatively newly created country like Pakistan. It was because Sheikh Mohammad Abdullah knew this and bluntly said so often enough, including at the UN, that Liaquat called him a “Quisling” and the Pakistan Government routinely defamed him as an “Indian stooge”. Yet the Sheikh was known by all in Srinagar Valley as the “Lion of Kashmir”, and had been the acknowledged voice of Muslim political awakening in the Valley ever since 1931. J&K’s democracy today is the principal political legacy of Sheikh Abdullah. The Pakistan Government to this day denies legitimacy to the elected Government and Opposition of Indian J&K despite there never having been in the history of Pakistan a change of government more democratic in nature than that which occurred in J&K in 2002, bringing in the PDP-Congress Government in place of the National Conference. Before Pakistan had started its series of military coups, Abdullah had led J&K to adopt an exemplary Constitution and ratify the State’s joining of the new Indian Union. The unbridgeable gulf between Abdullah and the Pakistan Government arose because Abdullah, a Koran scholar and devout Muslim known to intersperse his political speeches with Koranic wisdom, relied for J&K’s constitutional principles not on Islam but rather on the French Constitution. Pakistan’s constitutions by contrast say Pakistan’s sovereignty belongs to Almighty God, leading to perennial confusion over the mundane business of governance here on Planet Earth. It was the tragic depraved Rahmat Ali, driven by his deep personal anti-Hindu bigotry, who put the “K” into “P, A, K, I, S, T, A, N” purportedly representing “Kashmir”. In his crank view of history, all of Punjab, Afghanistan, Iran, “Tukharistan” (sic) and more would be part of Pakistan too. The new country might have been better named after a person (as are Colombia, America, Israel), viz., “Iqbalistan” after Mohammad Iqbal who conceived it. It was Iqbal’s seminal 1930 speech to the Muslim League at Allahabad that described the areas (aside from Indian Punjab) that actually constitute post-1971 Pakistan: “I would like to see the Punjab, Northwest Frontier Province, Sind and Baluchistan amalgamated into a single state. Self-government within the British Empire or without the British Empire, the formation of a consolidated North West Indian Muslim state appears to me to be the final destiny of the Muslims at least of Northwest India”. “Dar-e-Islami-Hind”, “Indus Islamic Republic”, “Indic Islamabad” or “Republic of North-Western India” also may have been alternatives to the random acronym Rahmat Ali coined in 1933 on a London bus. Though Kashmiri himself, Iqbal made no reference to J&K or any of the so-called “princely states” (nor to what became East Pakistan). The legal theory later sold by Britain to both India and Pakistan was that a “Lapse of Paramountcy” over “princely states” would occur on 15 August 1947 before or after which their rulers must “accede” to one or other new Dominion of Britain’s Commonwealth. BR Ambedkar in a brilliant analysis showed this to be erroneous in law: “paramountcy” over any “princely states” which had not acceded passed automatically to the legal successor state of British India, and that was the Dominion of India. The Dominion of Pakistan was a new state in international law, created out of certain designated territories of British India the day before British India extinguished itself. If, for example, Chitral or Junagadh acceded to Pakistan after that date, it would have to be with the acquiescence of British India’s legal successor, namely, the Dominion of India ~ an acquiescence granted in case of Chitral and denied in case of Junagadh. In case of J&K, all such matters became moot once hostilities broke out between India and Pakistan following the tribal invasion of J&K from Pakistan that commenced October 22 1947; Pakistan’s plan to take over Gilgit by force had been made months before that. The erstwhile State of J&K descended into civil war and chaos, becoming an ownerless entity whose territories came to be carved up by force of arms by both new countries (and in case of uninhabited Aksai Chin, by Communist China also some years later). Pakistan’s failure to properly develop as a state today ~ in particular allowing its military to bloat in size relative to other social and political institutions and even to possess nuclear weapons intended against the Indian Union ~ has resulted out of the neurotic obsession with Kashmir. India owes a democratic responsibility to residents of the Indian State of J&K to choose their nationality freely under conditions of full information and individual privacy; if some, like Syed Geelani, choose to renounce Indian nationality and either remain stateless or seek the nationality of Pakistan, Iran or Afghanistan, they may still receive permanent residence in India and be legally akin to the many foreign nationals who live and work in India permanently and peacefully. That may be as much as India can realistically contribute to helping the Pakistan Government resolve its neurosis over Kashmir. Pakistan’s military naturally possesses a fierce loyalty to Pakistan ~ the best way for that loyalty to be implemented in practice may be for General Kayani to allow the country’s public institutions to gradually normalize in size and function. Once Musharraf’s rule comes to an end or a legislature under new clear-headed leaders comes to exist some day, the military may be able to recognise that.